Justin Sullivan/Getty ImagesApple’s ‘spaceship’ campus, located in Cupertino, California, cost $US5 billion to build. Apple employees keep walking into glass panes inside the company’s new “spaceship” headquarters, Apple Park, reports from MarketWatch and Bloomberg say. The injuries were reportedly so bad in two cases that the company had to call emergency services. The Apple design guru Jony Ive considers Apple Park to be a masterpiece of design. 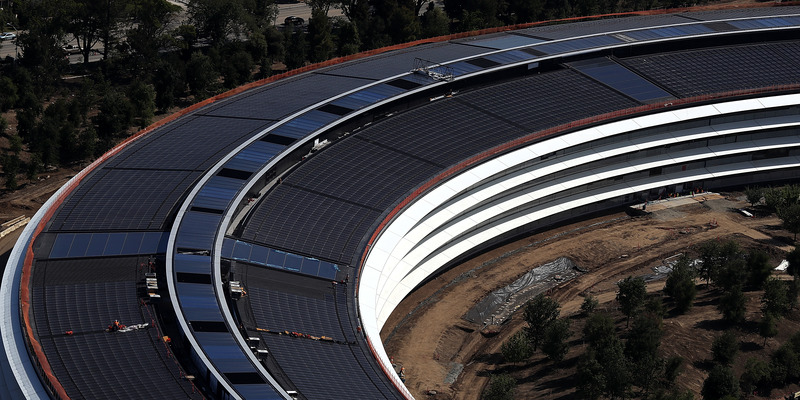 Apple Park, the tech titan’s new Silicon Valley “spaceship” headquarters, is considered a feat of architecture and design – Apple’s design chief, Jony Ive, himself led its creation. And yet, the campus seems to have a problem: People keep walking into the building’s signature glass walls and doors, according to reports from Bloomberg and MarketWatch. MarketWatch cites sources at Apple who say that because so much of Apple Park’s interior is made of glass, people keep smacking into walls and closed doors. In two cases, the injuries were so bad that the company had to call emergency services, MarketWatch confirmed with public records. Recognising the problem, employees began to put sticky notes on glass doors so employees would know they were there. But Apple management removed them because they didn’t match the design of the building, Bloomberg reported. Apple’s cofounder Steve Jobs originally proposed the $US5 billion Apple Park campus shortly before his death in 2011. It officially opened to Apple employees earlier this year, supplanting the 1 Infinite Loop campus as the company’s main seat of power. But the notoriously secretive company will probably never allow the public to see inside, CEO Tim Cook said at a shareholder meeting earlier this week. Read the original MarketWatch story here and the Bloomberg report here.